I usually have two kinds of goals for the New Year: accomplishment goals and feeling goals. Accomplishment goals might be working on a new book, making website updates, or advancing my photography. Feeling goals are about improving the way I feel or how my relationships feel throughout my day. I began making feeling goals following a profound accident and health crisis. I learned that we can choose how to feel better no matter what we accomplish. And, the better I feel, the better my accomplishments turn out. This New Year, my feeling goal is tenderness—an idea I got from butterflies. I’ve always wished for a gentler more tender world, where it’s easier to remain open. Meeting up with sharp-edged experiences can thicken the armor we carry around our hearts. That armor protects us from feeling vulnerable—sort of, in that it’s numbing. On the flip side, being numb cuts us off from feeling a range of emotions in our own hearts, including joy and beauty. Raising monarchs from eggs to butterflies this past summer made me aware of armor I still carried around my heart. The eggs I collected were tiny and fragile, about the size of a pencil tip. Newborn caterpillars are smaller than a fingernail clipping and easily lost among the milkweed leaves. Even the bigger, thicker caterpillars are soft, squishy, and vulnerable. When the caterpillars finally transform into chrysalides, they seem so safe inside their green and gold-studded jewel-like container. But even this container, where the most miraculous metamorphosis takes place, is vulnerable to predators both large and small. No wonder less than ten percent of a monarch’s 300 to 400 eggs survive to become butterflies. Some scientists think it’s only 1% to 2% that survive. Human activities add to their survival problems. The reduction of open land, loss of monarch food and habitat, GMO crops, and the deadly herbicide, Roundup, threaten the very existence of monarchs. Thus my original intention for raising monarchs—to increase the population and raise awareness of ways to help save these magical beauties. In the process, they taught me many lessons. I had to be oh-so tender if my monarch eggs were going to survive and grow into butterflies. Even gently pulling the big caterpillars off leaves during cleaning and feeding could trigger a response, in the most sensitive caterpillars, to “play dead.” To avoid this, I had to mindfully slow down my actions. I had to handle them gently within the range of their own movement patterns during collection, cage cleaning, feeding, occasional chrysalis relocation, and their final release into blue skies. As I interacted with them during all these lifecycle stages, that tender feeling became more embodied in my movements, how I used my hands, and the rhythm of my breath. Even my eyes softened as I learned to look more carefully at what I was doing. Becoming more tender with butterflies made me realize how harsh I could be with myself and guarded with other people. I liked the way tenderness had softened and released the tension in my body so I began to consciously soften the way I related to myself and others. After all, people are like butterflies—we’re all in some phase of becoming and need some tenderness to make it through to our next phase. My relationships with others began to change and soften. I did my best to treat edgy people with tenderness, and some of them softened in return. Like caterpillars and butterflies, some people are more fearful, some want to interact, while others enjoy more distance and freedom. I began to treat old emotional and physical traumas with more tenderness instead of trying to ignore or muscle through their cries for attention. Treating these parts of myself tenderly soothed their calls and released old tensions. Even though my work raising monarchs was originally meant to help increase their declining population, I discovered they were my teachers. Their vulnerability, both as individuals and as a species, offered me an opportunity to loosen my heart’s armor and become more tender. It’s a gift I keep unwrapping as I make my way through a world with edges, yet try to stay soft as a butterfly wing. Sally is a writer, nature photographer, and certified hypnotist/health coach. Eight years after a profound near-death experience, she wrote a self-help book called Golden Words, which guides readers to the science and spirit of golden words® and teaches mind-body-spirit techniques for using them effectively. 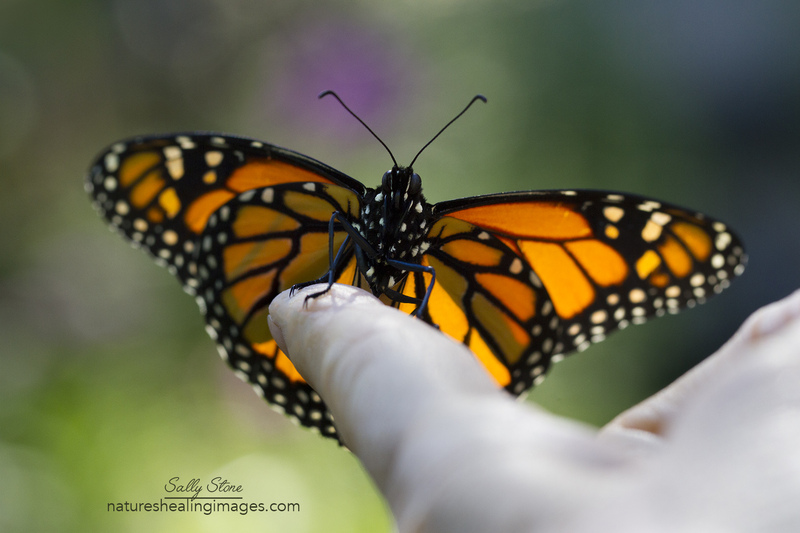 Passionate about the divinity and healing power of nature, Sally published her first photographic children's book, I Am a Butterfly, to share the miraculous and metaphorical story of metamorphosis. A mystic at heart, Sally turns to nature for life lessons and thinks everyone, deep down, is a flower that's destined to bloom. Sally earned her Masters and Doctorate in Education from National-Louis University with an emphasis on understanding how children who write and share their personal stories experience being seen.